The French Film Festival UK celebrates its 20th anniversary this year (8 - 30 November) with a programme bigger and stronger than ever before ! As a long standing supporter of ’La Fete du Cinema’ over the years, we are pleased to accompany this important edition with ’The Universe of Jacques Demy’ a season dedicated to the French director that will get you in the mood for the upcoming feast of French cinema! 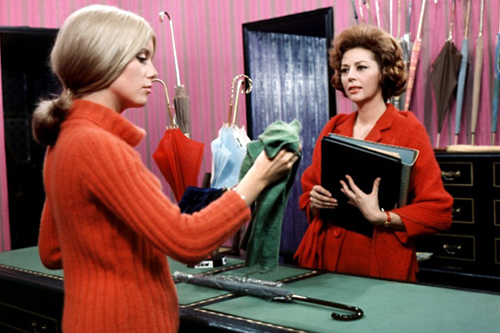 Guy Foucher (Nino Castelnuovo), a 20-year-old French auto mechanic, has fallen in love with 17 year-old Genevieve Emery (Catherine Deneuve), an employee in her widowed mother’s chic but financially embattled umbrella shop. On the evening before Guy is to leave for a two-year tour of combat in Algeria, the pair make love. Genevieve becomes pregnant and then must choose between waiting for Guy’s return or accepting an attractive offer of marriage from a wealthy diamond merchant (Marc Michel). Featuring a cavalcade of colours, sumptuous cinematography and an ingenuous score by Michel Legrand, the romantic Les Parapluies de Cherbourg is undoubtedly Demy’s masterpiece. Nominated for four Academy Awards - including Best Original Score - the film also won the Palme d’Or at the 1964 Cannes Film Festival. Now in its 20th year, the French Film Festival (8 - 30 November 2012) presents a wide spectrum of French-language cinema from major hits to cutting edge new directors and retrospectives at leading cinemas throughout the country. Cities covered include London, Birmingham, Manchester, Warwick, Cardiff, Edinburgh, Glasgow, Aberdeen, Dundee and many more. Read more about the 2012 programme on the FFF website.